A. Stomakhin, C. Schroeder, L. Chai, J. Teran, A. Selle. 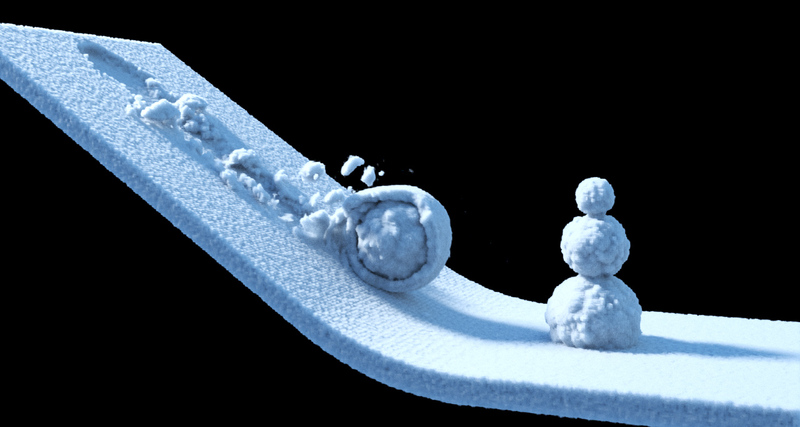 A Material Point Method for Snow Simulation. ACM SIGGRAPH 2013. The paper presents a novel snow simulation method utilizing a user-controllable elasto-plastic constitutive model integrated with a hybrid Eulerian/Lagrangian Material Point Method (MPM). The method is continuum based and its hybrid nature allows us to use a regular Cartesian grid to automate treatment of self-collision and fracture. It also naturally allows us to derive a grid-based semi-implicit integration scheme that has conditioning independent of the number of Lagrangian particles. The method is the core of the production simulator Matterhorn at Walt Disney Animation Studios which was used extensively for deep snow effects in Frozen (2013).